The young heroine of "The Wild Geese", Otama, is forced by poverty to become a moneylender's mistress. She is surrounded by skillfully-drawn characters - her weak-willed father, her virile and calculating lover (and his suspicious wife), and the handsome student who is both the object of her desire and the symbol of her rescue - as well as a colorful procession of Meiji era figures - geisha, students, entertainers, unscrupulous matchmakers, shopkeepers, and greedy landladies. Like those around her, and like the wild geese of the title, Otama yearns for the freedom of flight. Her dawning consciousness of her predicament brings the novel to a touching climax. Ogai Mori (1862-1922) stands in the foremost rank of modern Japanese novelists. His professional success as an army surgeon was outstripped by his even more brilliant ascent in the literary world of the Meiji and Taisho eras. His work is characterized by a strong humanistic element, a romantic quality effectively tempered by realism, and a lucid style that often rises to lyric intensity as in the closing passages of The Wild Geese. 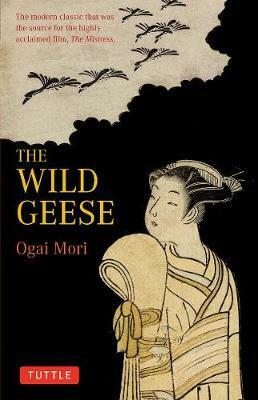 Written in 1913, The Wild Geese enjoyed such success in Japan that it was made into a film, shown abroad as The Mistress.